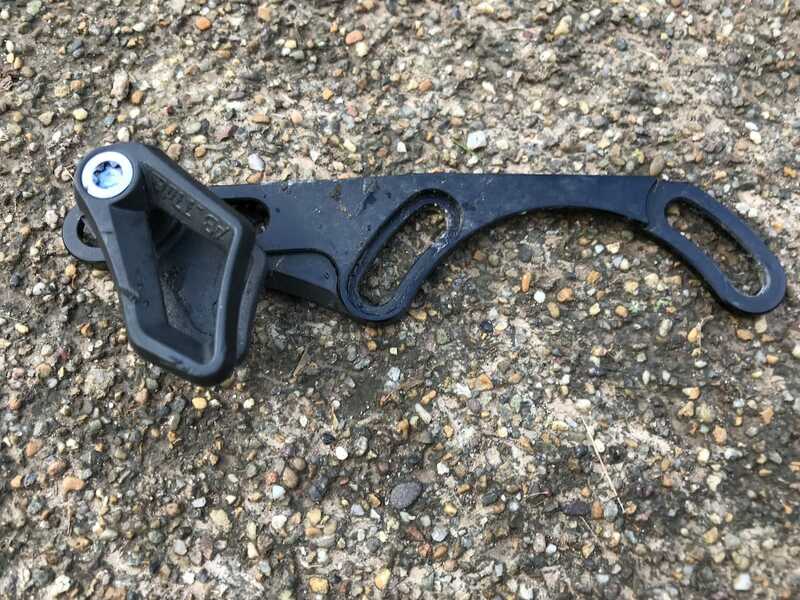 The Absolute Black Oval chain guide is a highly versatile top guide designed to watch over your chain – whether you run oval chainrings or not. It’s also very, very light. We sent one to Rachel Sokal to see just how effective it is, and what it’s like to setup on different bikes. 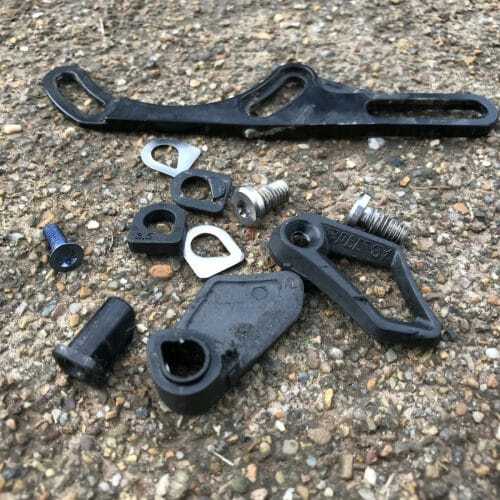 Traditionally chain devices were heavy-duty looking things that used bottom guides (with or without a top guide depending on whether you were running a front mech or not) and perhaps a bash ring and rollers. Whilst reliable, the downside of such systems is they are heavy, the rollers add drag to your chain and you need to remove your cranks to fit. Thankfully, the use of clutch-equipped rear mechs and 1x drivetrains mean that for most trail and Enduro riders, a top-only chain device does a very effective job, making full downhill-style double roller systems redundant. 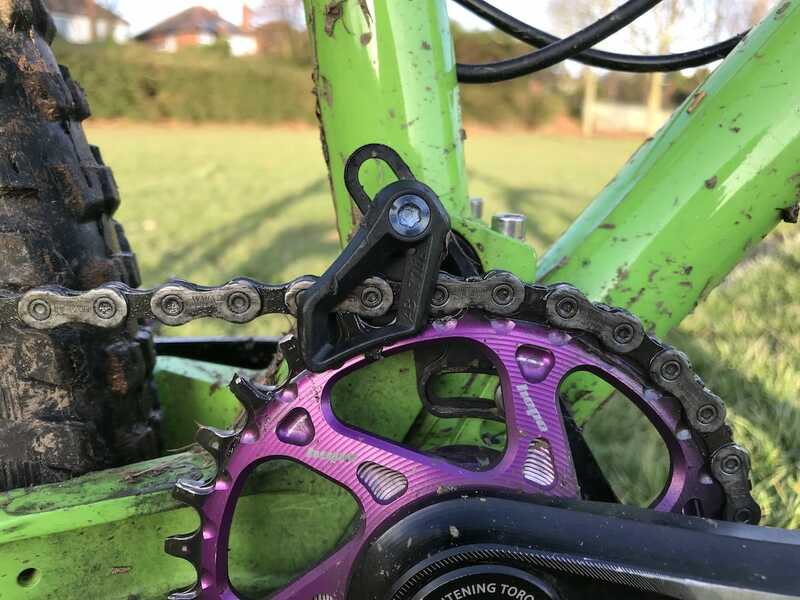 Narrow-wide chainrings hold onto the chain much more securely, and the clutch provides sufficient chain tension so that a roller isn’t required. The most obvious benefit of a top-only guide is weight-saving but it also means that you can fit the guide without removing your cranks or chainring (depending on the attachment system of course). Including hardware, the Oval Guide weighs just 24 Earth-grams. One of the lightest chain devices comes from CNC perfectionists Absolute Black. At 22g claimed (24g on my kitchen scales including all spacers and bolts) it’s around a third lighter than the listed weights of other similarly designed devices. A hefty percentage no doubt, but on something so small the difference is just 10-12g (Ed: But then if you’re serious about grams, you’ll know it all adds up right?). At £46 it’s at the upper end of pricing of similar devices which is expected given how light it is in comparison to its peers. In addition to its weight, the beauty of the Absolute Black guide is that it is fully adaptable for oval rings as well as round. 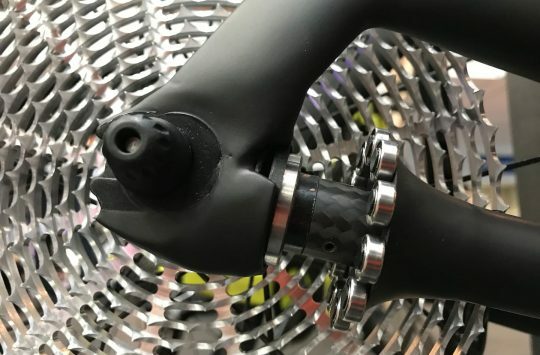 Absolute Black designed its Oval Guide with enough vertical height through the cage that it’ll accommodate the varying diameter of an oval chainring. It has a capacity of 26-34T for oval, though it’ll just as happily accommodate regular rings with a capacity of 28-36T. With more and more mountain bikers experimenting with oval chainrings, that makes this an ideal option for those riders who might want to switch around between different chainrings. Using a selection of spacers it is compatible with single ring 10, 11 and 12-speed set ups and a chainline of 48-53mm, so it’ll work with Boost and non-Boost set ups too. The included hardware is neat, and while it takes time to setup, it’s very versatile. The Absolute Black device fits via an ISCG05 mount and its titanium T25 bolts. Don’t have ISCG05 chain guide tabs? Absolute Black makes this same guide in two other versions, which include an upper direct mount version, and an S3 lower direct mount version (that’s E-Type). Attaching the back plate via ISCG mount was easy enough even with a chainring in place but you will need a long-ish hex key to reach through the ring. Selecting and fitting the spacers (to account for your chain line and number of gears) and actual guide with the back plate in place was a little more tricky. Those silver spacers allow you to get the chainline bob-on. Absolute Black’s fitting guide suggests that you fit the back plate and measure with a digital micrometer, remove the back plate, fit the spacers and guide to the back plate and then refit to the bike. This approach would certainly be easier than trying to slot them into place in situ like I did but is still a reasonable faff. Having said that, it’s a one-off job so in the grand scheme it’s not a big deal. Gradation marks on the back plate indicate where to set the top guide depending on what size and shape ring you’re using so this part is easy to set-up and adjust if you’re changing between rings. Once fitted, the front-half of the guide itself rotates on the bolt which means you can lift to access your chain without undoing bolts. 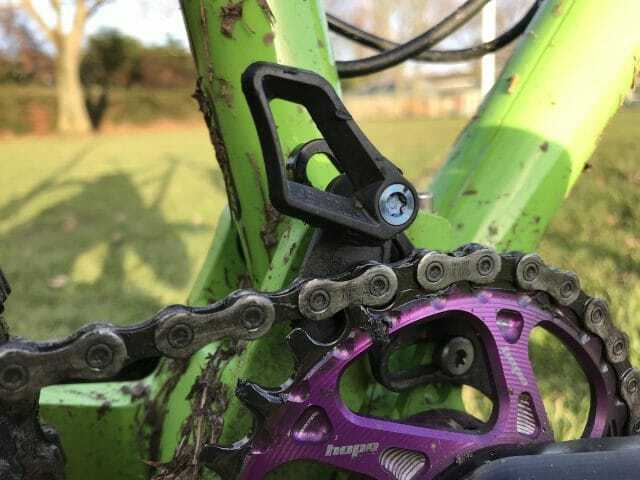 The main benefit of this would be on-trail mechanicals (my patience has really been tested when having to get other devices off after crashes and jammed chains). Luckily I’ve not had any while I’ve had this device on test but it’s still been a useful feature for my home mechanics. I never jammed a chain during testing, but the rotatable guide allows quick access to the chain and chainring when needed. Now, I recognise that there has been an awful lot of preamble here and I wouldn’t like you to think that I’m padding this review too much. But without this waffle this would be an incredibly short review, as I can say very little else about the guide except it works. Very well. 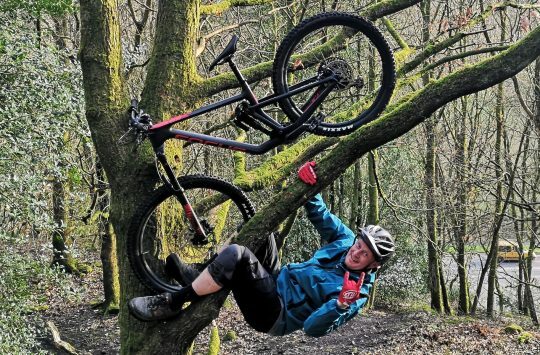 In seven months of riding including several enduro races, a month of bike parks in the Alps and trips to Revolution, Innerlithen and Bike Park Wales I have not dropped my chain once. Not once. I run a non-Boost round 30T chain ring (Cotic Rocket with Hope cranks and ring) so to test on a different chainline and oval ring I fitted to my other half’s Specialized Enduro with 142+ axle, SRAM cranks and a 32T oval chain ring and he didn’t drop his chain once either. So I can confirm that it works just as well with both oval and round chainrings. Pretty straightforward really. For the extra piece of mind, an upper guide like the Absolute Black Oval Guide is well worth it. 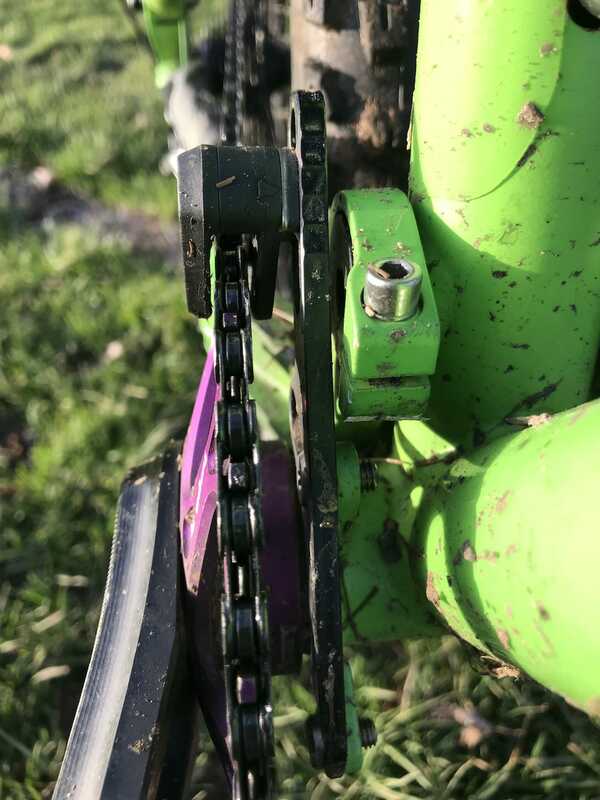 A very lightweight, very reliable top-guide chain device which works with a range of chain lines, ring sizes and oval rings too. It’s a little fiddly to set up but once on it performs flawlessly and gives tool-less access to your chain. For 24 grams, it’s a tiny weight penalty worth considering for the extra insurance to make sure your chain remains exactly where it’s supposed to. They are brilliant these wee things- I have the original one that this copied, the Shovel, it weighs nowt, fits in 2 minutes, no noise or drag- just bikey perfection. But would the chain have dropped off without a guide??? Bless the 2x set ups still running happily. 2×10 XT throughout, and never dropped a chain either. I also have a nice 478.32% range. 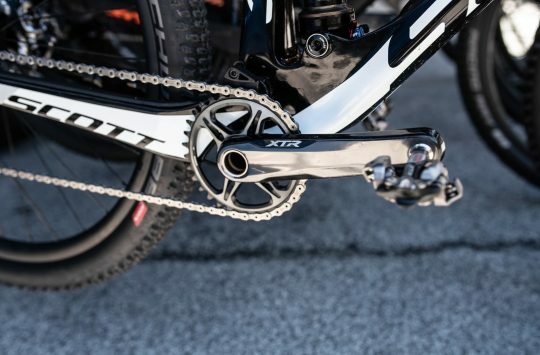 I’m not anti 1x, but it seems like a lot of faff, and not being a SRAM fan, when I do go to Shimano 1x with an Oval ring and its 418.18% range I do hope that the chain stays on, on its own. +1 to race number on a bike = chain drop. It just does. Evil fairies or something. So yes to a top guide with 1x. Are people who run 2x the drive train version of vegans ? i’ve never dropped a chain with any chain guide that was installed correctly. I had one. The original 77designs one. It died in a crash when the light alloy mount snapped. Maybe light isn’t always the best option.